On 1st/2nd March Manor Farm put on some magic and sparkle with their Window Wanderland event. The Manor Farm Community Hub Group commissioned local artist Deborah Weinreb to manage and facilitate this free community event for us. 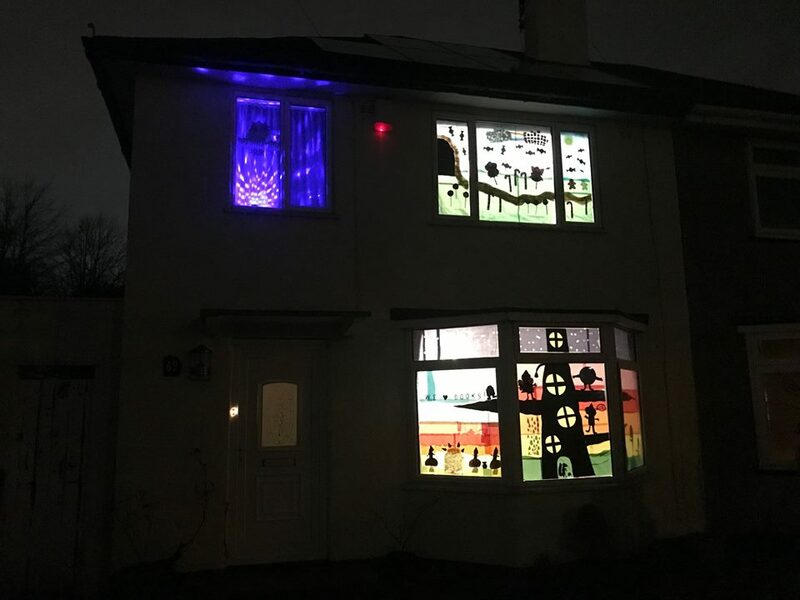 Local publicity just after Christmas encouraged residents to get creative and put on an illuminated display in their windows for these two evenings, the idea being that everyone could walk round and look at what everyone else had produced. During February Deborah ran some workshops at Horfield Leisure Centre and at Geoff’s Club using a variety of materials which were free for residents to attend to get ideas and inspiration and to create something ready to be displayed. Deborah also worked closely with Horfield C of E Primary School where the theme was Positive Messages to the World. The Leisure Centre and the Beehive also hosted displays and I would like to thank them all for their support. Although the weather on the weekend of the event was not great the 30 or so households who took part impressed with their creativity and ingenuity and it all made for an enjoyable overall experience, and all in all well done Manor Farm for getting on board this being the first time the event has been run in our area. Meanwhile enjoy looking at the pics and see if you can spot your own!